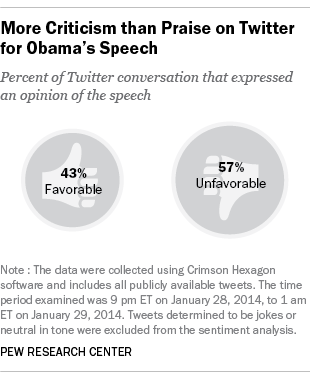 During and immediately after the State of the Union address, the overall reaction on Twitter was more negative than positive and virtually the same as last year’s verdict. The Pew Research Center used a combination of computer algorithms and human coding to analyze the reaction on Twitter in terms of the topics discussed as well as the sentiment expressed. 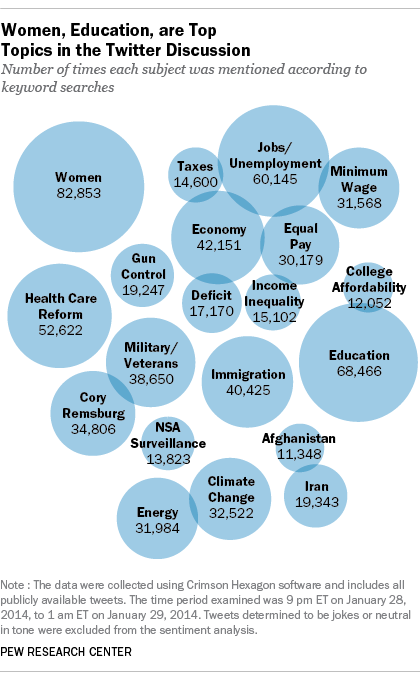 Obama’s attention to workplace equality triggered a good amount of the conversation. The word “women” appeared more often than 30 other search terms in the Twitter discussion, followed by such domestic topics as education, jobs, healthcare reform and the economy. That marks something of a shift from a year earlier when the education ranked first, minimum wage ranked second and gun control and the deficit were also in the top five. The 2014 SOTU conversation was also a bit more robust (1.64 million tweets in four hours) than the year before (1.35 million).